Wingback chairs are everywhere, begging to be made over and loved again. These chairs were a staple in living rooms across America in the 80's and 90's. Now you can find them everywhere, for cheap! 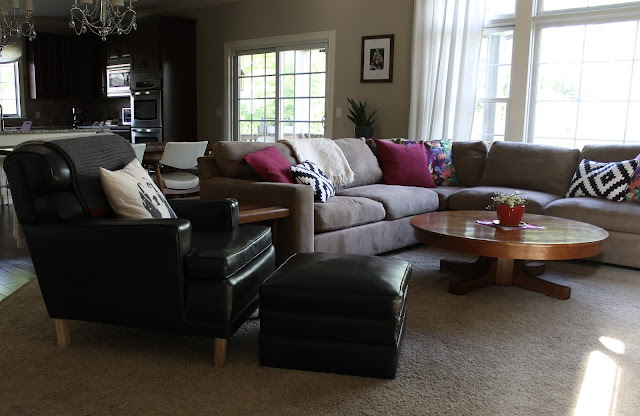 A few months ago my friend and neighbor, Jennifer, asked if I had ever tackled a wingback. Jennifer also happens to be an amazing photographer with a super cute blog. So no, I had not tackled a wingback yet. But I reupholstered a channel back chair, so this must be easier. One would think. Each project comes with a lesson. I learn something new with every piece of furniture, whether painting or upholstery. This project was a lesson in carefully lining up the print so the heavier pattern of dots was centered on the interior chair back, then flowed down to the cushion (both sides! ), and the lower front. That situation got a little hairy, but it worked out. The pattern on the interior of the arms runs horizontally, which I did not account for, and we had to order extra fabric for the arms. Thankfully, a fat quarter gave us the material we needed, and the patterns lined up perfectly. I do love how it turned out! 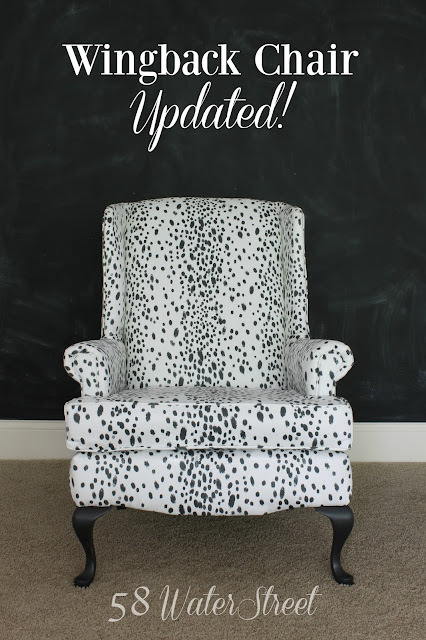 Jennifer chose this dalmation print from Spoonflower, in faux suede. At $34/yard she lowered the overall cost by pairing the print with coordinating linen on the back and sides. After several unsuccessful attempts at stripping the legs, Jennifer painted them in ASCP Graphite with Dark Wax, and distressed them just a bit. These prints go together beautifully. I think it tones down the busy dalmation print, and using two materials on a chair is very popular lately. Having this wingback behind me, knowing how they're put together, and having an understanding of the process, I would LOVE to take on another one. Maybe even a pair! 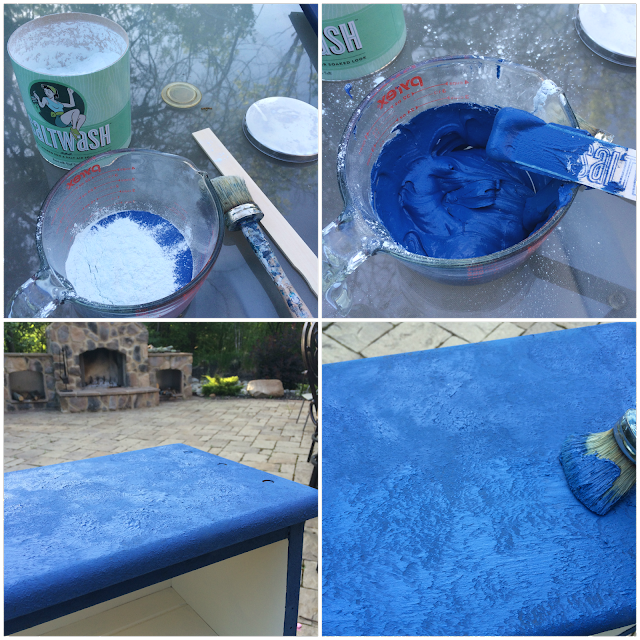 Last week I introduced the June Fab Furniture Flippin Contest, Coastal Inspirations, sponsored by Saltwash™. Over the weekend I finally finished my own project. I was so excited to try this stuff, and I was not disappointed! 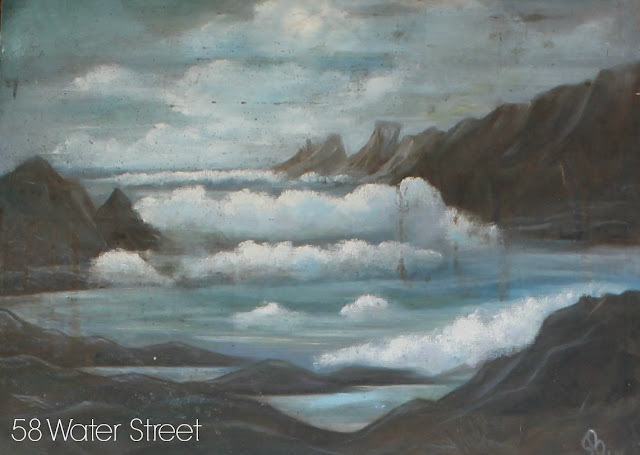 This is an old oil painting my Mom had in her stash. She sent it home with me last year, and I've been using it in the guest room. 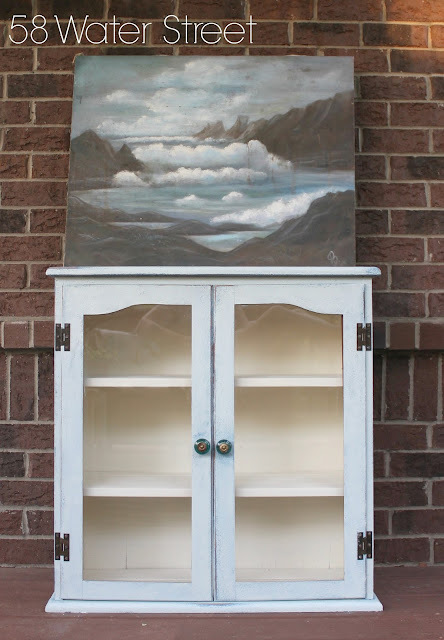 I focused on the light turquoise blues and whites in this painting for the inspiration. 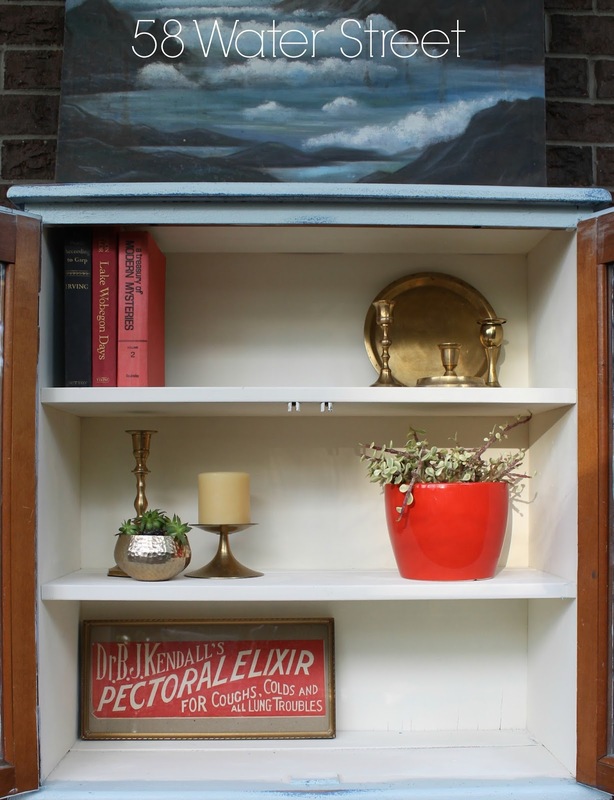 This sweet cabinet has been hanging out, waiting to be finished. I painted the inside, then ran out of steam. I followed the directions included in the package; add powder to any type of paint, any color of your choice. 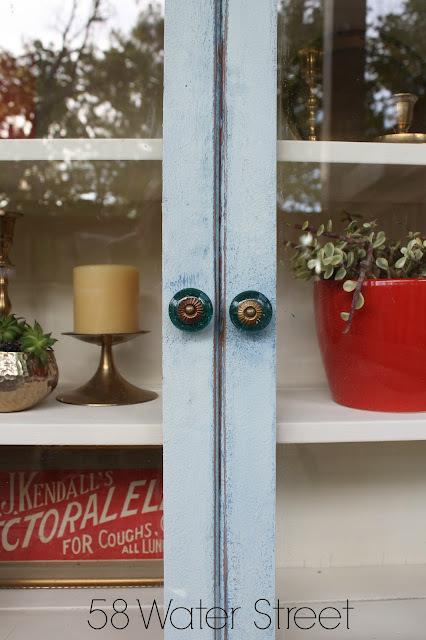 Mix to the consistency of cake icing, then apply the thickened paint to the furniture. Once it dries to a tacky, nearly dry texture, gently smooth the peaks with a brush. When the first color is dry, apply the second color. Their directions provide greater detail than mine! After the first coat, I added another color over the top, a very light aqua. This was the main color I wanted to see, with the dark blue peeking out from underneath. 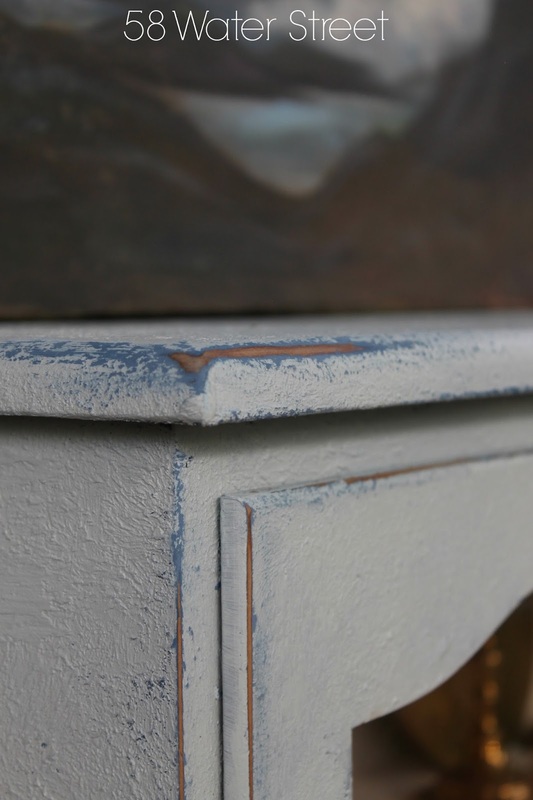 Then I sanded to expose a tiny bit of dark blue underneath, along with the original wood. 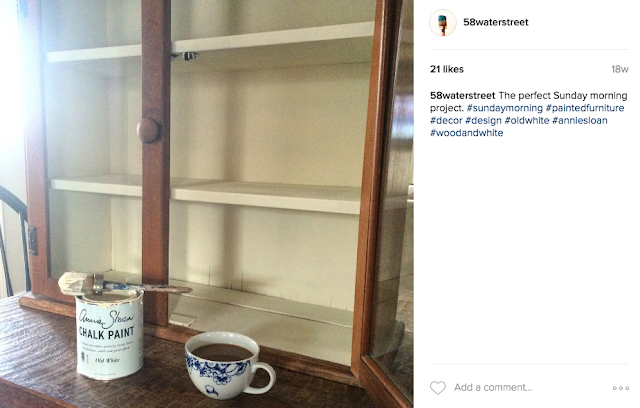 Like a true paint geek, I was thrilled with the amount of texture the Saltwash created. 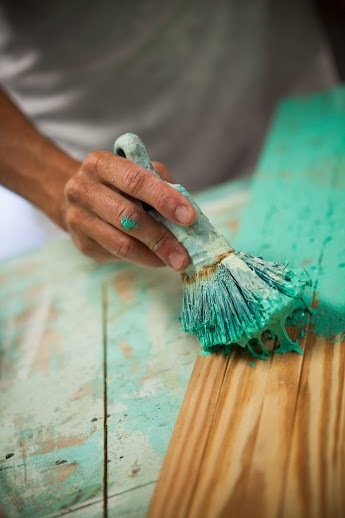 You can sand down the top layer to expose as much of the first color as you want. 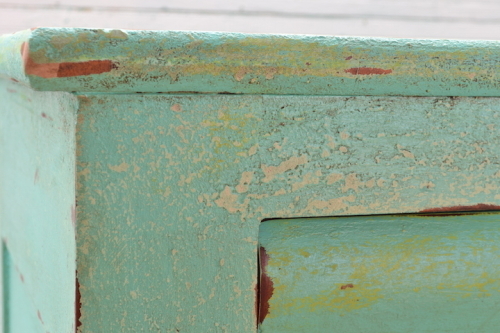 I only sanded along the areas where paint would naturally wear with use. This is going to be a great month; I am so excited to see what our talented furniture-loving contestants create! 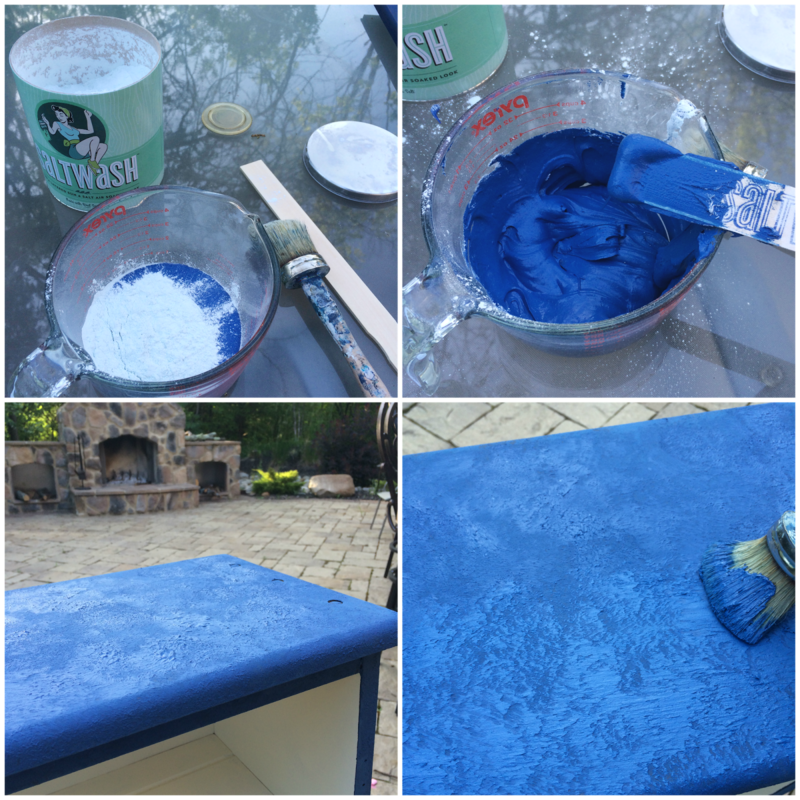 In the meantime, see how my cohosts used their Saltwash™! 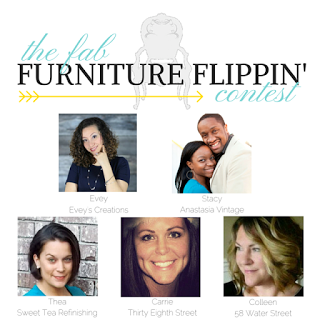 Welcome to the June Fab Furniture Flippin' Contest™! This month we are working with Saltwash™! I have been looking forward to this month for a long time. I get so happy about new and original products that allow me to try new techniques on furniture. Saltwash™ caught my eye a few months ago, and I was ecstatic when I heard they were sponsoring the Fab Flippin's Contest™ for the month of June! When I saw the tin, I was reminded of three of my favorite things: Jadeite, Rosie the Riveter, and sea glass, all combined into one cool product, and that's just the package! 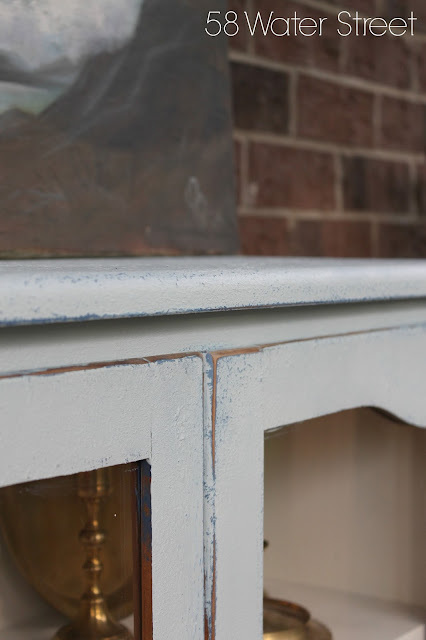 Saltwash ™ is a powder paint additive created by the owners of Saltwater Salvage Designs, that creates a unique weathered look on any piece of furniture or surface! Saltwash™ is the only product on the market that works with virtually all types of paint and creates the authentic, layered ‘saltwashed’ look that you want and can’t achieve with any other product! The theme for this month is Coastal Inspirations. The winner will receive a one-year supply of Saltwash™ and a $250 gift card, and a grouping of Saltwashed frames! Check back, I will be sharing my project this week! 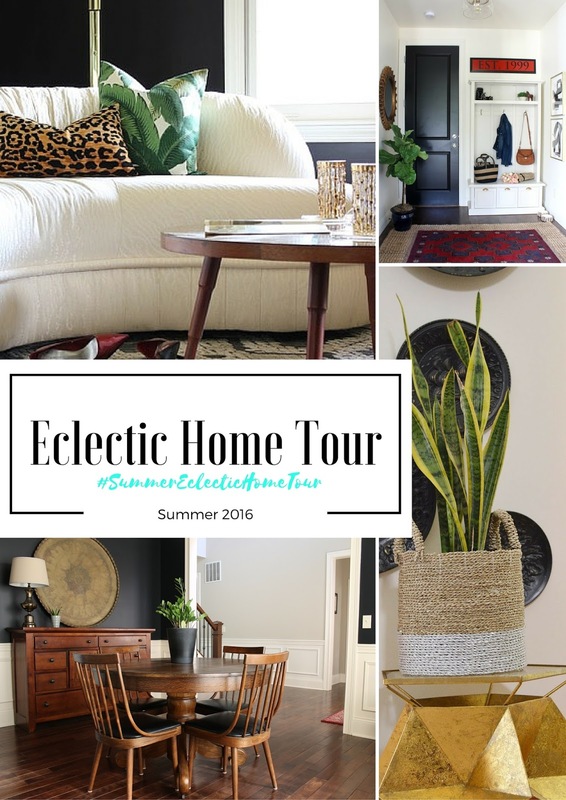 Welcome to Day 4 of the Eclectic Interiors Summer Tour! I am blown away by every single tour this week. I see so much of my own style in the homes of these amazing ladies! 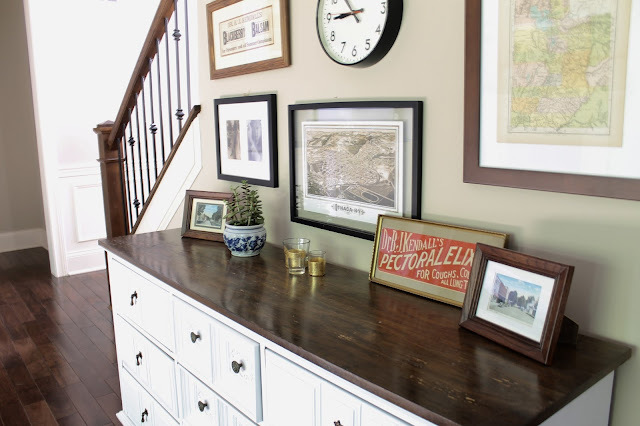 I spot things from our own home; beautiful items saved from thrift stores and given a second life in these beautiful homes, bursting with eclectic style. I am honored to be a part of this group! 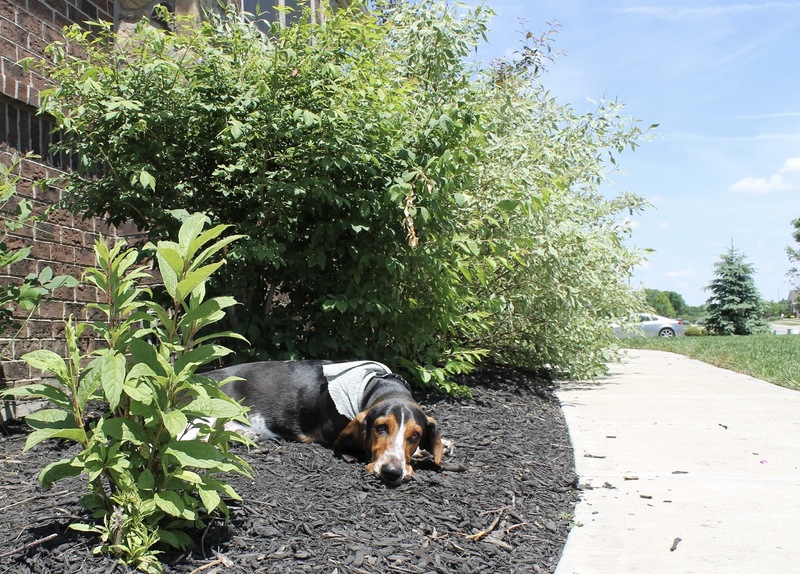 I grew up in upstate NY, where you are surrounded by vibrant GREEN in the spring and summer. I desperately missed trees, bushes, grass and flowers when we lived in several other states. No trees...no hills...no green. At least, not the lush, thick, natural stuff I am accustomed to. Then we moved to Ohio, and I have been delighted with the beauty of all four seasons. Spring and summer are explosions of color and nature. 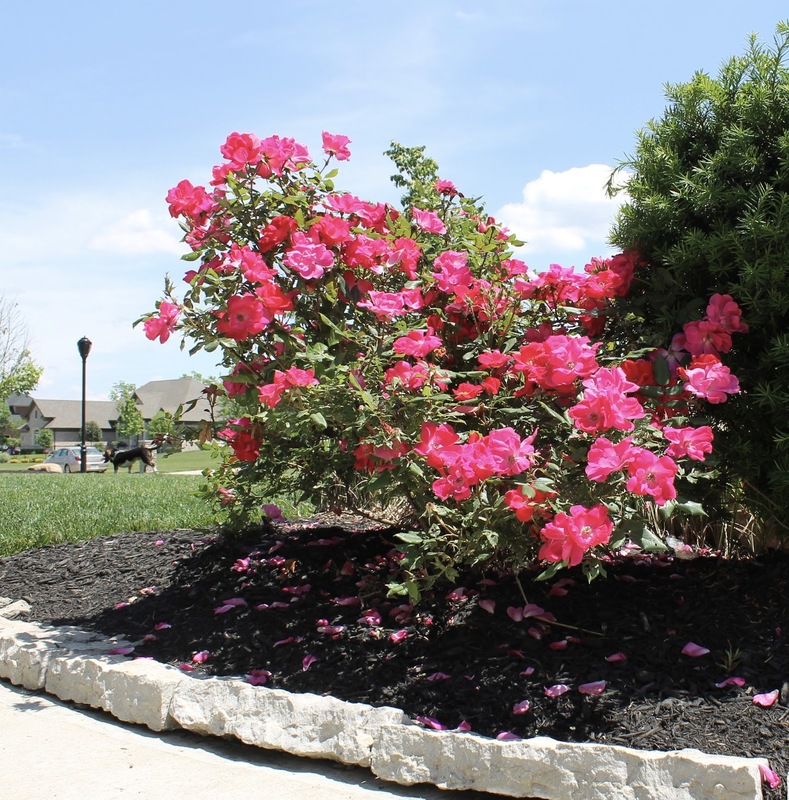 The previous owners of this home blessed us with amazing landscaping. Even more amazing...we haven't killed it yet. My husband planted that tiny lilac bush last year for our anniversary, and we thought it was dead. The bush, not the marriage. Ha! This year it came back, and maybe someday it will grow my favorite flower? 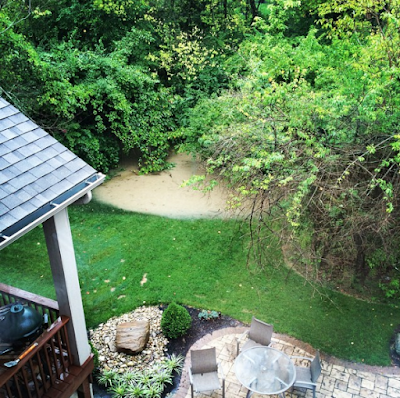 The creek is one of my favorite features. I encourage the kids to get in there and explore. They find tadpoles (catch and release, kids!) frogs, and an occasional snake. We hear the bullfrogs croak loudly. The kids make snacks with their friends and cross to the other side of the creek to eat the snack on a log. Seriously. It melts my adventure-loving heart. I cherish the memories they're making. Even with the beautiful landscaping, some of my favorite plants are the wildflowers, and the areas left untouched by the landscapers. I have always loved a nice field of wildflowers. And the sticks. Jasper asked me to talk about the sticks. Our yard is a stick heaven. From the deck off the kitchen you can see the outdoor fireplace, and outdoor kitchen, which essentially convinced us to buy the house. We love to entertain out here. 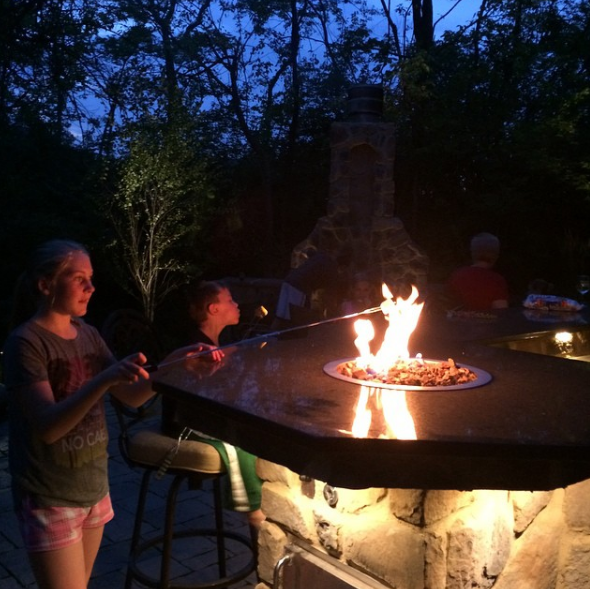 Throw some music on the outdoor speakers, make smores, hang out with friends while the kids run through the trees catching fireflies and shooting nerf guns. We have a routine of reading books together on the deck, after showers, just before bedtime. But it can get humid in the summer, so we pick up and continue in the fall. My little herb garden is just beginning. Cilantro, basil, mint, and rosemary. Herbs are one of the few plants I can grow well. I love having a ready supply of herbs for fresh pesto, mojitos, guacamole, sangria, etc. One of the first rooms I tackled was the dining room. 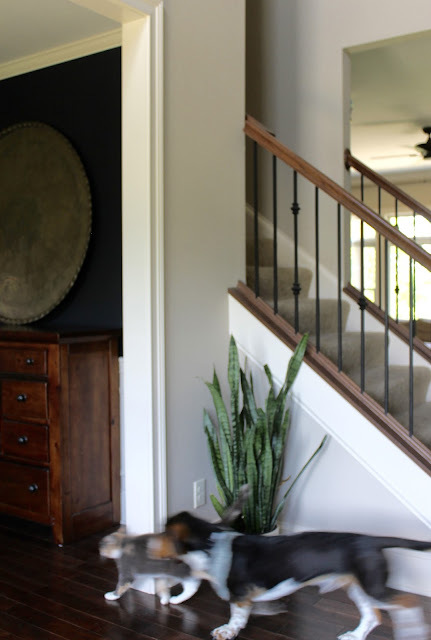 The dark navy blue walls are nearly black, but this room is flooded with natural light, and the white molding keeps it from feeling too dark. The brass tray was a thrifted find, brought to me by a friend who knows how much I love old brass. The chairs brought the whole room together. I love a sweet set of vintage chairs. Nearly every inch of the house was goldy-beige when we moved in, but I am not a fan of goldy-beige, so I painted the entire main floor of the house BM Annapolis Gray. What a difference! 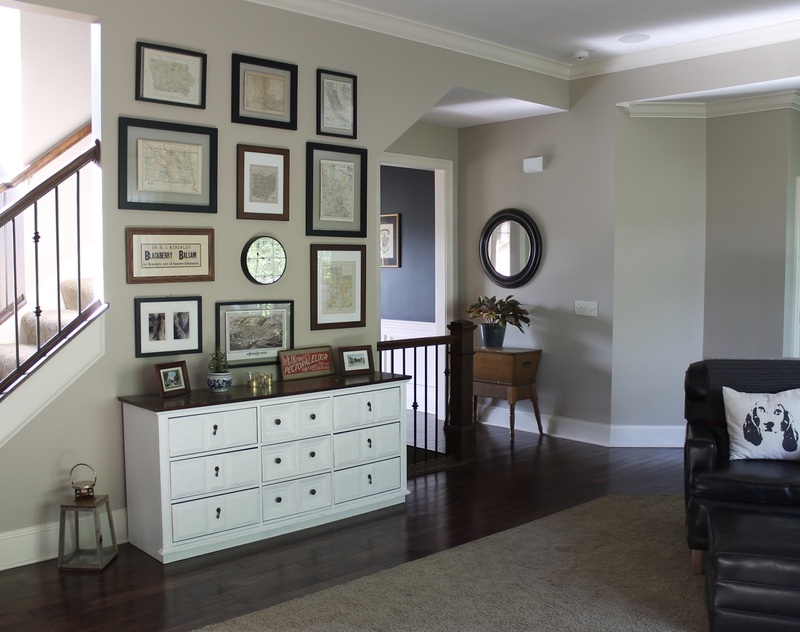 It's lighter and brighter, and more neutral. I never get tired of this scene. It feels like we live in a tree house. In our previous house we looked right at the back of the neighbor's house, awkwardly close, so we really appreciate the privacy. I might be afraid of color. I like to use color and pattern in small places that are easily switched out for the season, and keep a neutral background. 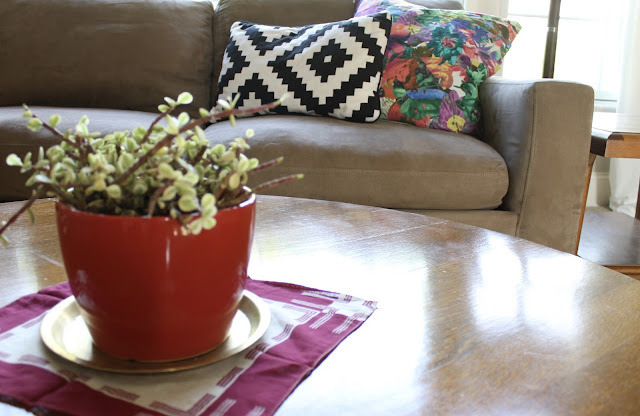 These floral pillows add color for summer. Truthfully, I would love to play around with color more, but it makes me nervous. This pair of vintage handkerchiefs adds a bit of color. 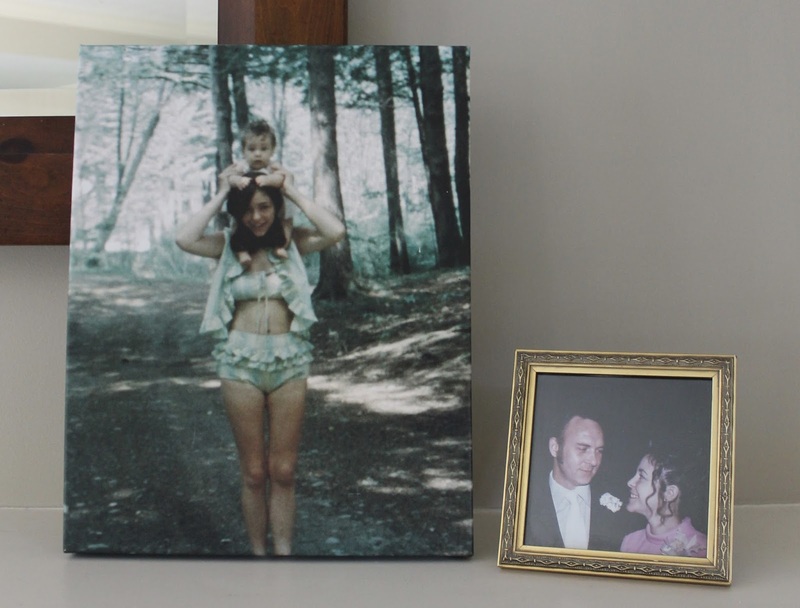 One on the table, and the other framed on the mantle. 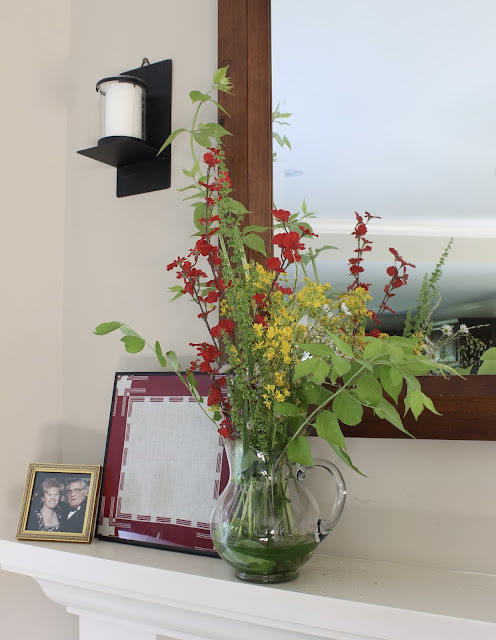 Ella picked wildflowers from our back yard for this arrangement. Check out my mom in 1967! I love this picture of her with my sister. 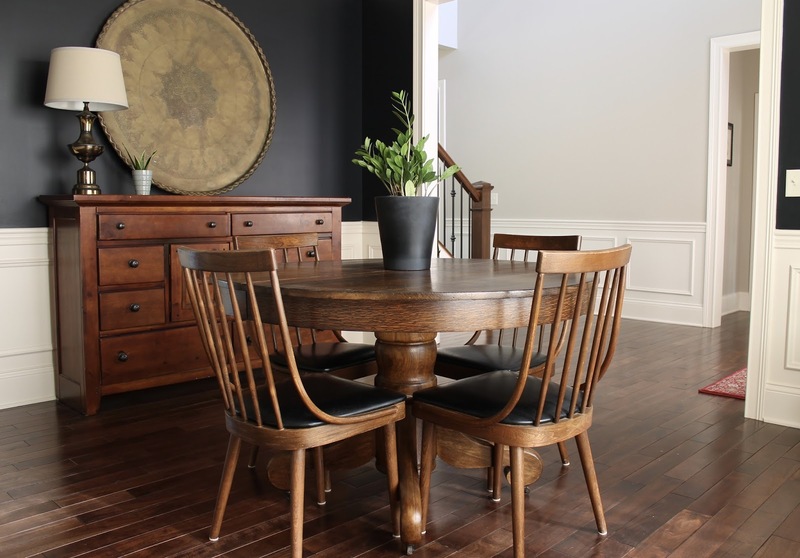 In the kitchen I recently traded our set of country black windsor chairs for these Eck Adams beauties. I love the midcentury chairs mixed with the farmhouse table. The other chair fills in until I find the perfect set of chairs to go on either end. I try to keep it simple, and that chandelier above the table is killing me. Not my choice. It will be gone with the kitchen makeover. Even Jason agrees...the chandeliers must go. Chandeliers. Oh yes. There are two. Twinsies. I catch myself physically blocking the chandeliers out of the picture with my hand just to envision how much simpler the room would be without them. Are you doing it too? Are you putting your hand in front of the chandelier to block it out? Welcome to my world. Let's focus on a scene of calming succulents. These rooms were personalized right away. As often as we move, I try to make their rooms a priority so they have a place of their own that they love. 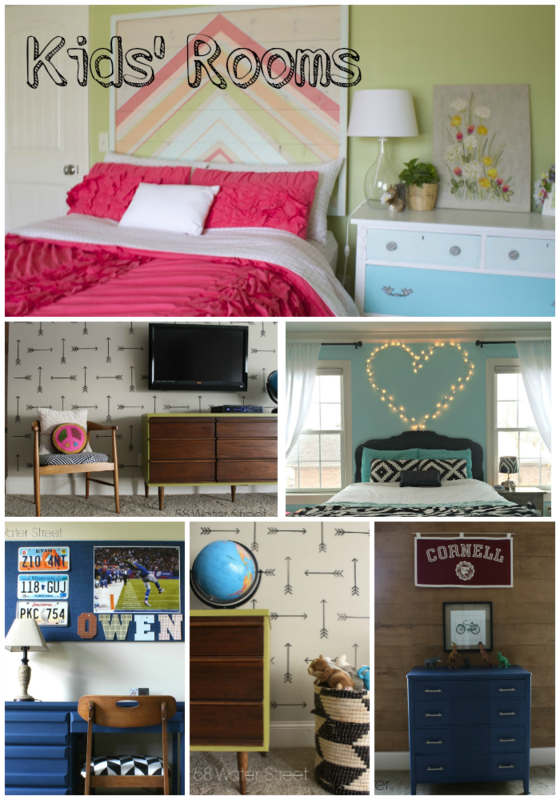 See Ella's room, Natalie's room, Owen's room, and the playroom. There are so many rooms I haven't touched. 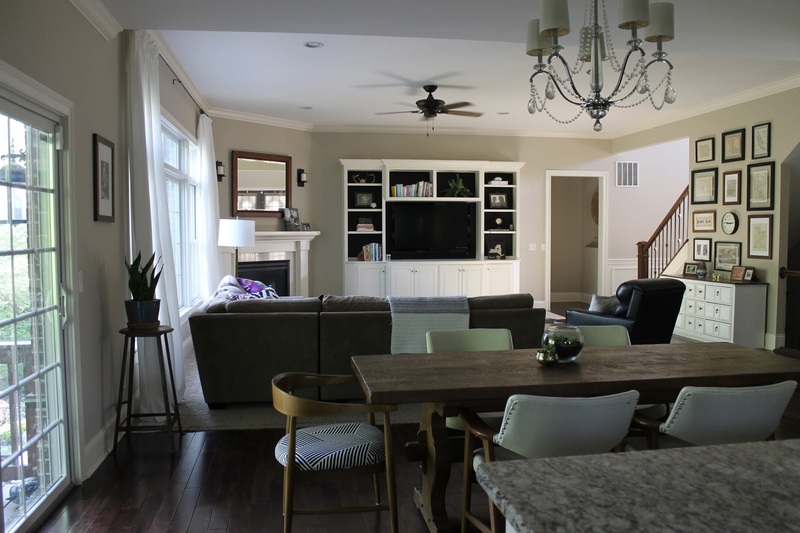 The entire finished basement, our master bedroom, the office, the powder room, the mudroom, the laundry room, and the kitchen. The kitchen is next on my list, but it is such a undertaking; it will require new lighting, new tile, updated cabinets...I'll save that post for another day. Now! Go see the tours from earlier in the week, but only if you want tons of super cool inspiration.